The Lineage of the Profound Guidance through AH, also known as the AH Tri, is one of three lineages of Dzogchen teachings in the Yungdrung Bön tradition. (See previous posts regarding The Aural Transmission of Zhang Zhung and the Renowned Three Cycles of Dzogchen.) This lineage of Dzogchen teachings was closely associated with the Dru family. From Menri Abbot Nyammé Sherap Gyaltsen until Menri Abbot Kunzang Gyaltsen, the lineage was passed down through the abbots of Menri Monastery. 1. Founder of the lineage, Me’u Gongdzö Ritropa. He is often referred to simply as Dampa, “The Sage” or “The Saint”. (See previous post, The Saint.) He exhibited many signs of accomplishment such as flying through the sky and leaving his hand and foot prints in stone. Although his primary focus was upon his meditation, he also wrote a number of texts. In addition to material he collected from other sources, he added his own gong ter, or mind treasure, to this collection. He organized the practice of the A Tri into 80 meditation sessions. 2. Gomchen Barwa. He was an unconventional person and became a great yogi. He was known for odd and somewhat dramatic displays. One day, Gongdzo Ritropa took Gomchen to a grassy area that was quite wet. The lama knew that Gomchen was known to have been quite athletic in his youth. So he told him to make a great leap. In doing so, Gomchen slipped and violently fell down. In that very instant, he achieved spiritual realization without interruption. Rather than taking ordination, he remained a laymen his entire life. He had many disciples and attained the rainbow body of light. 5. Drogön Yorpo Mepal. He composed a commentary for the Guidance through AH teachings. 7. 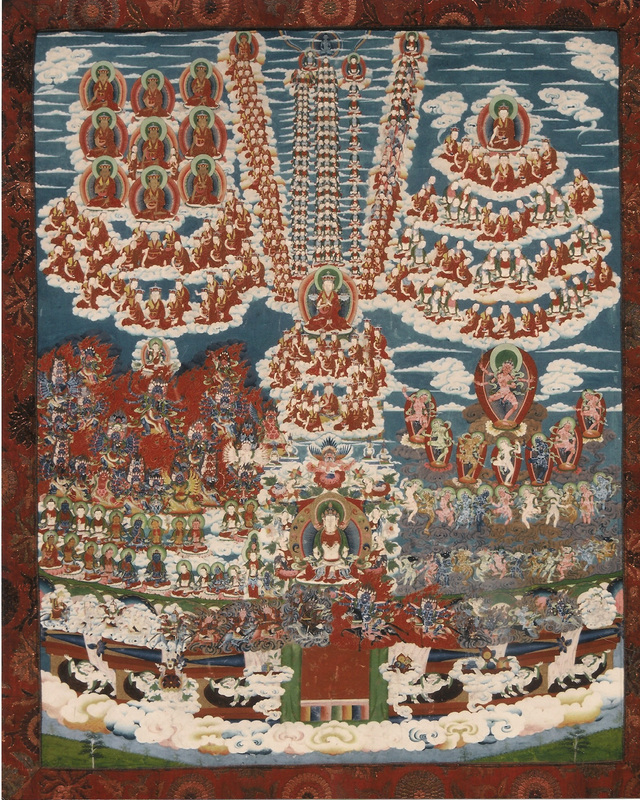 A Zha Lodro Gyaltsen, 1198-1263. He condensed the number of meditation sessions to 30. 9. 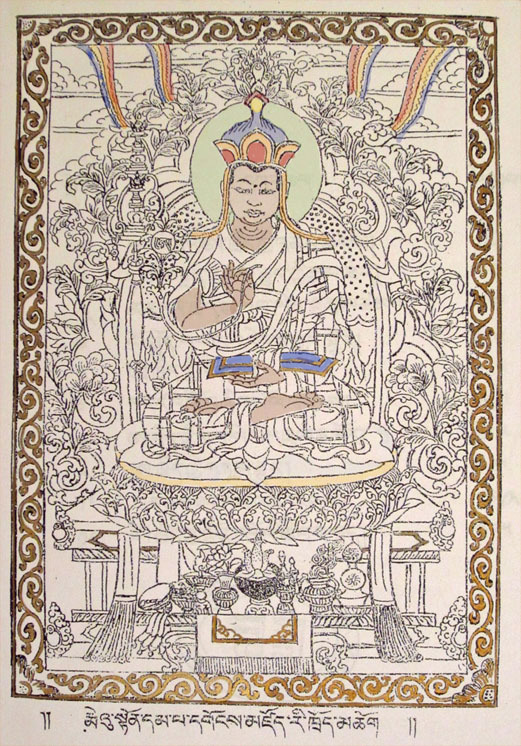 Druchen Gyalwa Yungdrung, 1242-1290 A.D. He was born into the Dru family in the area of Yeru Wensaka in Central Tibet. He received his monk vows from his older brother, Dru Dulwa Rinpoche. He was once the abbot of Yeru Wensaka Monastery which was founded by his family. He further condensed the number of meditation sessions of the Guidance through AH to 15 and composed the fundamental practice text “AH Tri Practice in 15 Sessions”. 10. Dru Namkha Odzer. He was the younger brother of Dru Gyalwa Yungdrung. 11. Dru Sonam Gyaltsen, 1268-1321. He was the nephew of Dru Gyalwa Yungdrung. 12. Dru Sonam Lodro, 1277-1341. 14. Rinchen Lodro. His mother was from the Dru family. 16. Rinchen Gyaltsen. He became abbot of Menri Monastery in 1415. 17. Namkha Yeshe. He became abbot of Menri Monastery in 1446. 18. Kunzang Gyaltsen. He became abbot of Menri Monastery in 1464. 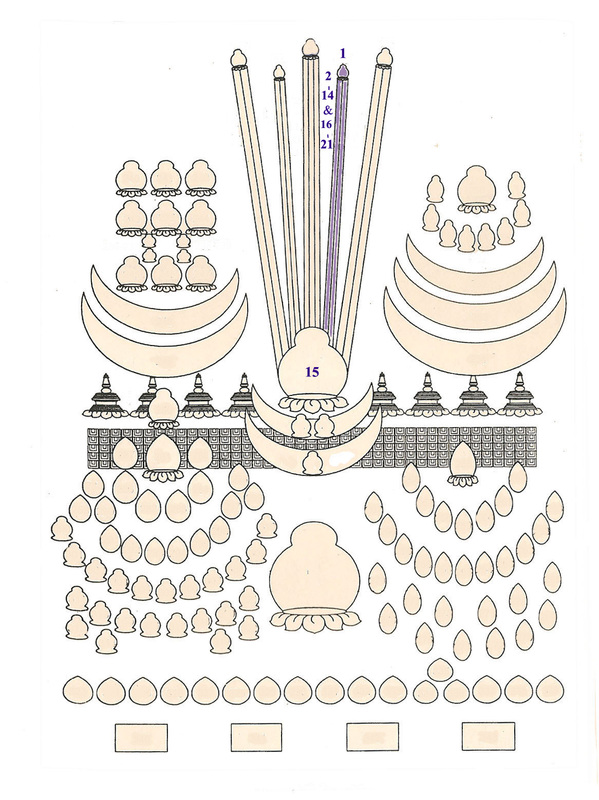 Posted on May 3, 2015, in Iconography, Prayer and Ritual, Tibetan Lamas, Zhang Zhung Nyen Gyu. Bookmark the permalink. Leave a comment.